The contest is open to anyone who attended FUN HOME at the CAA Theatre. To enter the contest, visit www.funhometo.com (“Website”) and submit an entry form by providing name, e-mail address and consenting to receive electronic communication from The Musical Stage Company. Contest closes May 20th, 2018 at 11:59 PM. One winner will be randomly selected and contacted via e-mail on May 21st, 2018. (A) Contest Prize: The Contest Winner will receive a trip for two (2) to New York City, New York consisting of the following: (i) round trip economy class airfare for Contest Winner and one (1) guest to New York City, New York from Toronto, ON (airports to be determined); (ii) three (3) days/two (2) nights hotel accommodations [room + tax only; incidentals not included]; (iii) two tickets to any Broadway musical of Contest Winner’s choice; (iv) all taxes related to accommodations, airfare, & Broadway musical tickets as specified above. The trip must be booked and completed within one (1) calendar year of Contest Winner notification, specifically May 21st, 2018 to May 20th, 2019, or Contest Winner forfeits the Prize in its entirety. 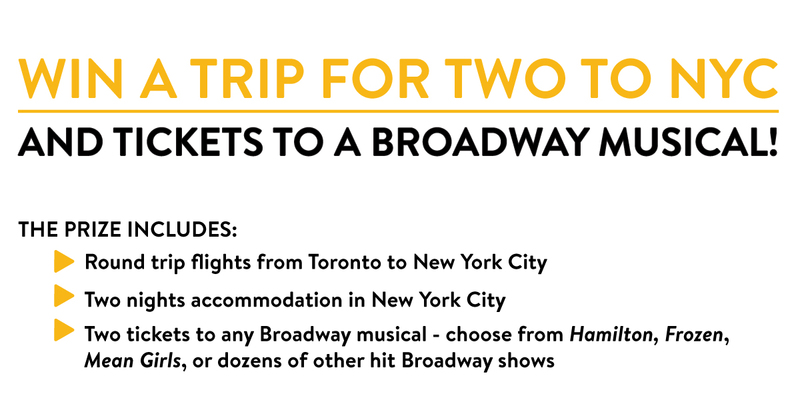 Actual value of the Prize Package may vary based on airfare fluctuations, rate of hotel accommodations and price of two (2) tickets to Broadway musical selected. Contest Winner will not receive any cash value for the difference between actual value and ARV. Odds of winning the Contest Prize Package depends upon the number of eligible entries received during Contest Entry Period. Trip must be booked at least sixty (60) days prior to departure. Trip subject to availability and blackout dates. Travel must be round-trip. The Musical Stage Company will determine airline and flight itinerary, as well as Hotel Accommodations, at its sole discretion. No refund or compensation will be made by The Musical Stage Company in the event of the cancellation or delay of any flight. All expenses and incidental travel costs not expressly stated in the package description above, including but not limited to, ground transportation, meals, incidentals, passenger tariffs or duties, surcharges, airport fees, service charges or facility charges, personal charges at lodging, security fees, taxes or other expenses are the responsibility solely of the Contest Prize Winner. Travel package does not include transportation to the location of air travel departure, ground transportation from airport to hotel, gratuities, bar, and beverage charges or items of a personal nature. Contest Winner’s travel companion (“Guest”) must be at least sixteen (16) years of age or older as of the date of departure. If Contest Winner’s travel companion (“Guest”) is under sixteen (16) years of age, the Contest Winner must be the travel companion’s parent/legal guardian. Travel companion must travel on same itinerary and at the same time as the Prize Package Winner. Travel companion must execute liability/publicity releases prior to issuance of travel documents. Travel restrictions, conditions and limitations may apply. Contest Prize Winner and travel companion (“Guest”) are solely responsible for obtaining valid identification and any other documents necessary for international travel. Contest Prize Winner and travel companion are solely responsible for their own conduct when accepting the prize and agree to comply with all applicable laws and regulations pertaining to use and enjoyment of the prize, including, but not limited to, consumption of alcoholic beverages. The Contest is open only to legal Canadian residents who are at least eighteen (18) years old as of the entry date. Employees of The Musical Stage Company and their parent, subsidiary, and affiliate companies, suppliers as well as the immediate family (spouse, parents, siblings and children) and household members of each such employee are not eligible. Participation constitutes entrant’s full and unconditional agreement to these official rules and The Musical Stage Company’s decisions, which are final and binding in all matters related to the Contest. Click for additional contest rules and regulations.